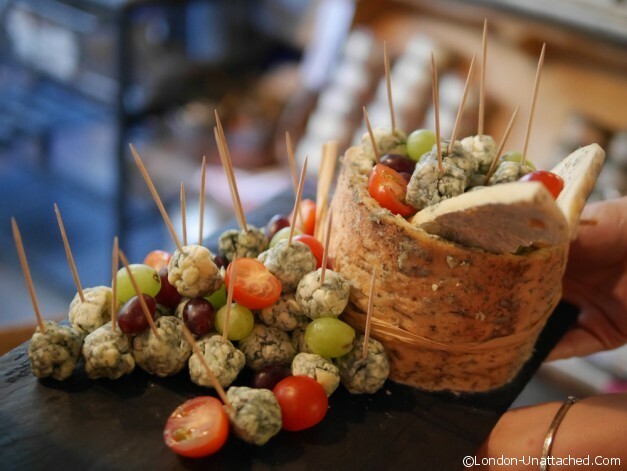 I first came across Champagne & Fromage when I discovered the pop-up in Covent Garden. I’d never really thought about the concept of Grower Champagne but once I’d listened to an empassioned co-owner and founder Stefano Frigerio, I was hooked. 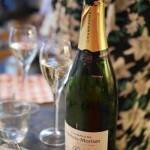 Grower champagnes are champagnes made by small wineries rather than the big brands, which blend grapes from all over the region. Having just a few hectares of grapes means that the wine makers need a certain kind of passion to create their product – it’s not about buying in what will make the most consistent wine, but working with what nature has provided. If you like, these are the artisan champagne producers. Most grower Champagne stays in France, but French Bubbles, the parent company of Champagne & Fromage, started life as an import business, bringing the wines from 5 family producers to London. 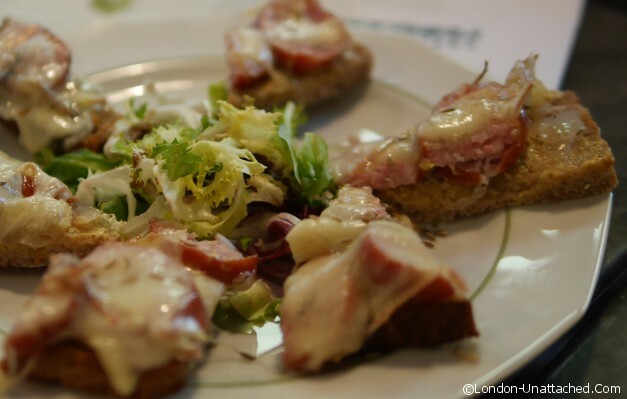 In Brixton, co-owner Maud Fierobe explained that starting the pop-up in Covent Garden was originally an experiment. It was an experiment that worked, despite the recession and the offering of award winning grower champagnes paired with cheeses and charcuterie from Une Normande a Londres soon expanded to the somewhat unlikely venue of Brixton Village. It’s a little while since I’ve visited either venue so I was thrilled to be invited to a cheese and champagne evening in Brixton Village, hosted by Maud herself. 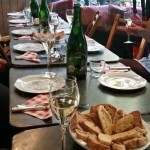 Champagne & Fromage run regular food and fizz tasting events, though everything we enjoyed can also be ordered from the menu. We started the evening with a glass of Champagne Pertois-Moriset Blanc de Blancs Grand Cru Extra-Brut nv. Made from 100% Chardonnay grapes, this is a very dry champagne with no added sugar. 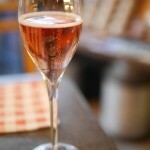 I have a preference for dry champagne in most circumstances and loved this refined glass of fizz with a minerally taste. 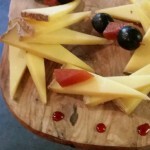 Pairing was with Comte and Fumaison cheeses and with Tartine Montbeliarde. 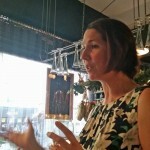 Maud explained that the Chardonnay helped to balance the smokiness of the Fumaison and the Montbeliarde. A posh cheese on toast, I loved the smokey touch of sausage. Our next Champagne, a real contrast, was Champagne Michel Furdyna Reserve Brut nv, 100% Pinot Noir. A clean, nutty drink with just a hint of citrus which helped it cut through the rich Brillat Savarin and the impressive Fourme d’Ambert. We also enjoyed another tartine, this time with small slices of fresh fig on melted Fourme d’Ambert. Champagne Lacroix demi sec NV was a 70% Pinot Meunier, 15% Chardonnay and 10% Pinot Noir. 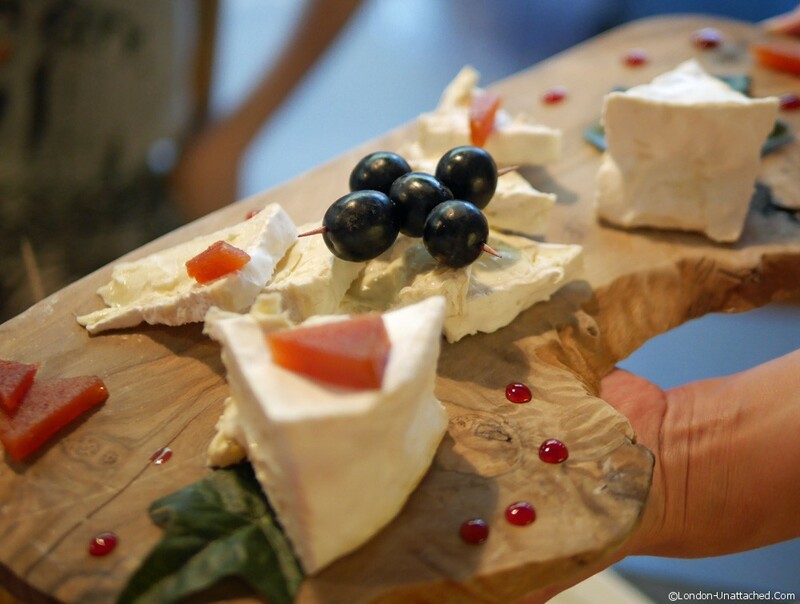 The high proportion of Pinot Meunier added a fruitiness which worked really well with the Langres Marinated, a soft cows milk cheese from Champagne, which is sometimes doused with Champagne (marinated) before being eaten. There was Brie de Meaux down the other end of the table but I didn’t get close to it, which wasn’t an issue given the large quantities of cheese I’d already eaten! For me, the best thing about the evening was the chance to get a better understanding of the Champagne grapes. It was a relatively simple tasting, really just introducing us to the difference between the three main Champagne grapes (Chardonnay, Pinot Noir and Pinot Meunier). Of course I wasn’t in the least bit disappointed with the food either. Sometimes moving produce like cheese and Champagne away from their home terroir doesn’t work. You need the weather, the ambience and the lifestyle too. But, in the French bubble of Champagne & Fromage you could almost have magically transported yourself over to France for an evening. 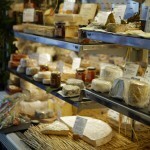 Champagne & Fromage offer French cheese, charcuterie and grower Champagne together with a range of artisan food products and gifts sets for sale in their shop. 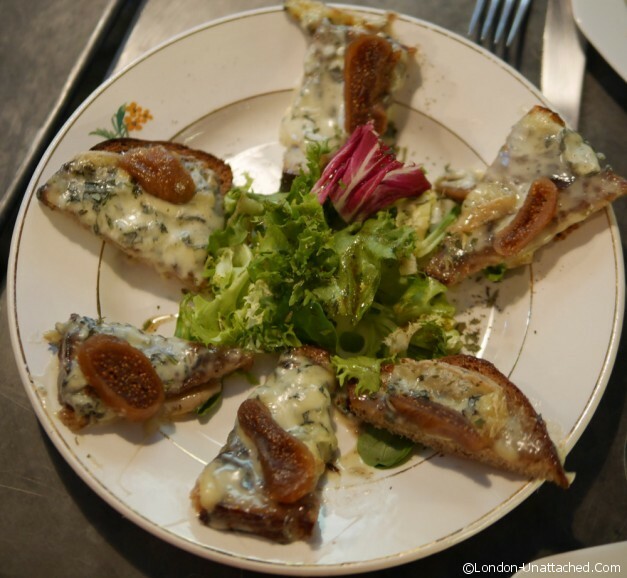 Both Covent Garden and Brixton have a small cafe where you can enjoy the sort of food I was eating, along with a glass or three of grower Ghampagne. And, there are Champagne tastings at both venues. How beautiful these all are! I imagine the combinations as well as the selection is a hit with everyone, not just with you. This does seem particularly your style. What a fabulous event. I love sparkling wines and champagnes are my fave. 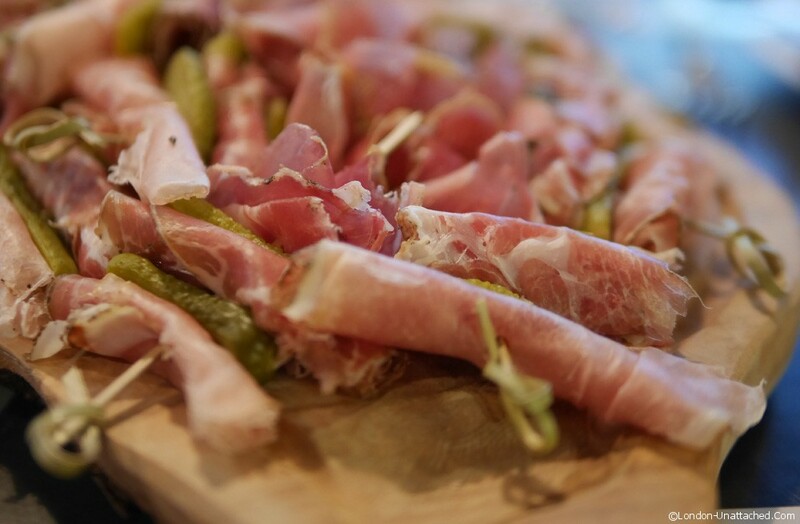 I love the way it pairs well with most foods…. especially cheese! 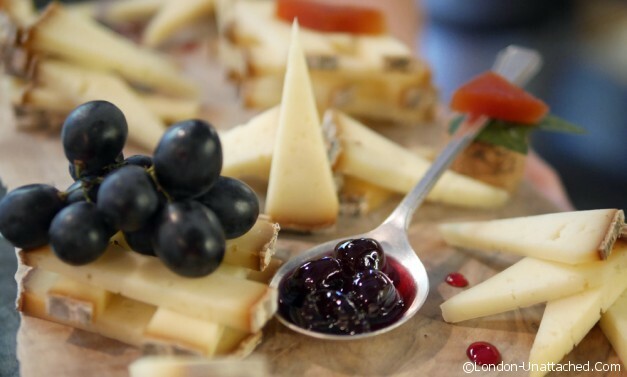 French cheeses are wonderful – they refuse to take any notice of the ‘rules’ and still make a lot using traditional methods. The result is infinitely more tasty!